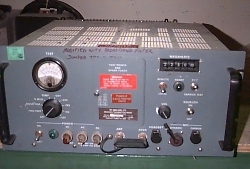 The AN/GRC 171 is a multichannel transceiver extensively used throughout the world to provide communications with aircraft. It weighs 75 lbs, is completely solid state and has a transmitter output of 20 watts. Operational communications are provided by AN/GRC-171 UHF (freqquency range 225 - 400 MHz) transceivers used for air/ground communications with combat and support aircraft, and for coordinating mission activities with the control tower, ground control, RAPCON, mobile units, and ground and air search and rescue equipment. Although the standard AN/GRC-171 radios that operate in the UHF range areare not designed for long range communications, they do provide a useful reception range of ~250 nautical miles.